Meet 30-year-old Cassandra Pireu-Pilossof on a quest to climb Kilimanjaro in March 2019 in an effort to raise both funds and awareness to build a library, inclusive of resources and librarian training for Qhobosheane Primary School in Soweto. Cassandra is one of the thirty volunteers who are part of the Adopt-a-School Foundation and Flight Centre Foundation #Kili4Kids campaign. According to education researcher, Nic Spaull, out of a group of 100 Grade 1 pupils, 50 will reach Grade 12. Of those, 36 will pass matric and twelve will enter university is what motivated Cassandra to be part of the team raising funds for the construction of a library at Qhobosheane Primary School, through Adopt-a-School Foundation. 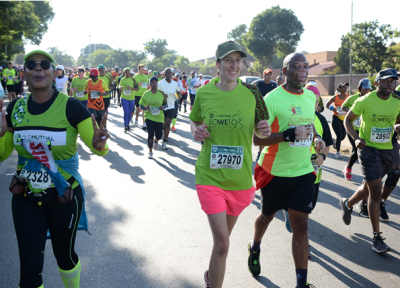 Soweto Marathon and Midmar Mile. With the expectation of a tough climb Cassandra will be taking with her only the essentials and a camera to ensure there is no excess baggage to prevent them in summiting for the children of Qhobosheane who are in need of a library and books. “I chose to be part of this campaign as working with the Flight Centre Foundation has been a wonderful experience, they have been deeply involved, passionate and committed to the improvement of Qhobosheane Primary School over the years. This initiative speaks to their ethos of engaging individuals to get involved and raise funds to help fast-track the implementation of projects that they have already committed to,” shares Cassandra. To support the #Kili4Kids campaign and help the challenges facing South African schools, people can attend a number of smaller events in an effort to raise funds. Please contact Diane Cleary: diane.cleary@flightcentre.co.za.